Ok, that's 12, but it's so hard to choose! So awesome that there are so many talented authors who write in the Christian fiction arena. See you tomorrow with a book to win from one of these authors! It's very hot here in Wisconsin right now. I don't think I have ever seen so many consecutive days above 90 degrees. And 90 is starting to sound chilly compared to the 100+ temps for today and Thursday. Not to whine (ok, maybe a little), but it's just too hot to even go outside that much! (Did I mention that the humidity is high too? None of this dry heat stuff.) I'm not a big fan of being overly hot. My face gets all red and splotchy and I sweat too much. Not attractive. So, when we were first married, I made my husband promise me that I could always put on the air conditioner whenever I wanted. It was almost part of our vows. But even the air conditioner can only do so much on days like this. So I'm trying to come up with things to do on really (miserable) hot days for my kids and me. Here's a start at my Top Ten Things to do on Oppressively Hot Days. 3. Mix together all the different kinds of Crystal Lite we have in the house. 4. Watch a movie next to the air conditioner. 5. Build and rebuild my daughter's Harry Potter lego buildings. 6. Look on Amazon.com for more Harry Potter Lego kits. 7. See how Crystal Lite mixtures taste when frozen. 8. Build a fort next to the air conditioner. 9. Thank God for the invention of air conditioners. 10. Watch a movie in the fort while eating a Crystal Lite popcicle next to the air conditioner. This weekend we went strawberry picking! This was one of the things on our summer bucket list, so I'm really glad we found a place that still had some. Our summer has been so hot already that we don't have too many farms with berries left. A side note about strawberry picking... Starting at age 7 and until age 18, I picked berries in the summers. To make money for college. I worked in berry fields, on my knees in between the rows, up to 8 hours a day, 6 days a week, for the 5-6 weeks of the berry season. Then I would pick raspberries or work on raspberry picking machines. Those were long days, but working in the fields with my friends was fun sometimes. We were paid by the pound of berries that we picked. And the "berry boss" made sure we did a good job. So part of the thrill of taking my family to pick them was to show them how hard I had to work, even at an age much younger than my girls are now. Anyway, we picked berries, and ended up with WAY more berries than we had planned to get...but it was so much fun! So now I am looking for all kinds of things to make with strawberries, especially since they are pretty soft already. Here are the ten things I've made with strawberries, with links to recipes as available. 2. More strawberry freezer jam. 3. Another batch of freezer jam. 4. Strawberry Pizza (recipe below). 8. Strawberry and chocolate crepes. 10. Strawberry brownies with Strawberry mousse on top. Whew! Good thing I can freeze a lot of it! So far, the crepes and the coffee cake are my favorite besides the jam. Crust: spread Pillsbury Sugar Cookie dough on 13" pizza pan (greased) and bake @ 350 for 10-12 minutes. Cool completely. Filling Layer: Blend 8 oz cream cheese with 8 oz cool whip and spread over cooled crust. Cover with whole berries (point up). Glaze: 2/3 cup sugar, 2/3 cup water, 1 heaping Tablespoon cornstartch in a small saucepan. Cook over medium-high heat until thick and clear. Add 3 Tablespoons of strawberry gelatin. Let cool so it doesn't melt the cream cheese layer. Spoon over strawberries. Keep chilled. Today is the last day of school for my kiddos. I know it sounds cliche, but I can hardly beieve the school year is over again! Now I have an eigth grader and a fifth grader! Where does the time go? 1. Catch up on school memory books for both girls. 2. Clean out closets and donate stuff to church's resale store. 3. Redo our family meal plans with more summer-type recipes. 4. Sew a throw-sized quilt for my daughter. 5. Read 10 non-fiction books. 6. Train for a 5K mud run in October. 7. Do a family Bible study. 8. Make pudding pops like my mom used to make. 9. Get more food from the Farmer's market. 10. Develop new items for my craft business. How does that sound? Our family bucket list is much longer and has more fun things on it, like going to a water park, raising caterpillars, making jam, doing tie dye shirts, making a reading fort, and helping my kids sew quilt tops. There's a lot more too, but those are some of the things. Today I'm trying to come up with a cute way to display our list. Doing some looking on Pinterest...fun! 1. Running for Mortals by John Bingham and Jenny Hadfield. 2. Searching for God Knows What by Donald Miller. 3. Self Talk, Soul Talk by Jennifer Rothschild. 4. Unsinkable by Abby Sunderland. 5. Lord, I Just Want to be Happy by Leslie Vernick. 6. Cleaning House by Kay Wills Wyma. 7. Breaking Free by Beth Moore. 8. I Thought it Was Just me, (But it Isn't) by Brene Brown. 10. Life is Hard, Food is Easy by Linda Spangle. So basically I just make a list of whatever 10 things I want to and link up to the Oh Amanda blog! 1. My middle-school girl's friendship heartaches and her longing to have close friends who care about her and aren't afraid to tell her. 2. My youngest's school work insecurities. 4. A new web design job I have that I can't seem to get off the ground. 5. An upcoming event that I am dreading. 6. My oldest daughter's schedule and how to manage her desire to be involved in EVERYTHING. 7. My own continued health struggles. 9. My children's Bible education and how to provide for that knowing they won't get it at school. 10. And number one some more. 3. Have a date with my husband. 4. Have a daughter date with each of my girls. 5. Read lots of books. 6. Start volunteering a little at school. 7. Keep going with P90X exercises. 8. Spend less time on Facebook. Spend less time obsessing about things others post on Facebook. 1. Fantastically beautiful fall colors on the trees! Took my breath away on my walk today! 2. Going to the apple orchard with my family. 4. Salted caramel lattes at Starbucks. 5. Watching my puppy try to chase squirrels. He scrambles after them, but gets so confused when he gets to the bottom of the tree they've run up and can't find them. He looks round and round the tree and looks so sad that he can't find them! Adorable and pathetic all at once! 6. I love all the cute pumpkin arrangements on people's front steps! 7. The big [huge] blow up pumpkins my neighbors put out on their front lawn! 8. Applesauce cooking in the slow cooker all day! 9. The perfect weather...mid-70s...no humidity, no mosquitoes, no snow! 10. Watching my kids jump in leaf piles! Found a new fun blog post group link for Tuesdays! 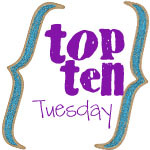 So basically I just make a list of 10 things and link up to the Oh Amanda blog! My Tuesday is not going exactly how I wanted it to. I have 2 sick kiddos home from school and I am struggling with the sense of not managing my day or my emotions very well. So here are the top ten things I thought I would be doing today that I am not doing because of sickness. 1. Going for a long walk with the dog. Instead I am playing fetch with him down the hall to give him exercise. I am exercising my fingers on the computer keyboard and my juice-pouring arm to bring the girls their vitamin C in liquid form. 2. Watching last night's "Castle" episode. I have it on the DVR. Waiting for me. But murder is probably not the most kid-friendly thing to watch while they are home. 3. Decluttering the toy room. Hard to manage packing up stuffed teddy and My Little Ponies when they are watching. 4. Driving youngest to karate. No hi-yays when sick. 5. Driving oldest to swim team. No crawling, breast-stroaking, butterflying, or back-stroking when sick. 6. Dusting out the ceiling fan in the bathroom. No real excuse here, just dread doing it. 7. Entering receipts into the budget software. Sick child watching Netflix on laptop. 8. Finding out the highs and lows of their days at school. 9. Mailing out book-winners books. Again...sick kids don't like to be left alone. 10. and the last thing I'm not doing b/c of sick kids is feel guilt-free. I feel utterly guilty that they got sick for some reason. I guess b/c some other moms have mentioned how healthy their kids are b/c of vitamins they take and I've been negligent in the vitamin-giving department. Now I feel guilt. Strangs top ten list for my first one. Please don't hold it against me since I am feeling mommy guilt mixed with cabin fever. I'm not my normal self.